Another interesting phone call that highlights the issues facing hotels trying to keep their reputation up to speed. It's difficult enough trying to keep all the customer service balls in the air without then being hammered by reviews that are actually glowing but are then being shown as a one star! Where's it happening? Well we'd suggest that you have a very quick look at your ratings under Google reviews as it looks as though the logarithm between Active Hotels and Google Reviews are going awry somewhere. 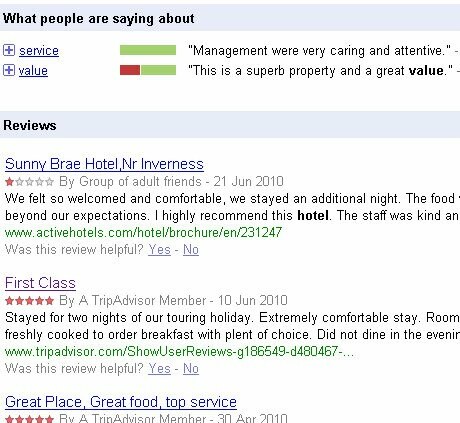 The hotel in question, The Sunnybrae Hotel in Nairn has sat with a 5 star rating for months and months on end and noticed that it has dropped down to three. Why? Well a quick investigation threw up a clear problem. All his 10/10 Active Hotel ranknigs were being displayes as a 1out of 5 on Google and thereby hammering his average ratings! Could it be that the Google is taking everything out of five and not recognising the scale of measurement? Meaning that a 10/10 is recognising only the 1 and converting it to 1/5. Surely not. We haven't found out the answer yet but when we do we'll let you know! In the meatnime however we'd suggest that you have a look at how your ratings are being affected.